“This is a new dawn for our generation. This is unusual. It is gratifying that they are here to see and share with us,” the middle aged man remarked with tears of joy when he saw the nine state governors trekking through the volatile Monday Market in Boko Haram hotspot, Maiduguri, shaking hands with fish mongers, vegetable sellers and taxi drivers. To this middle aged man, to the yam-seller who exclaimed “unbelievable” and to countless other ordinary Nigerians in that market, interacting with the governors up-close was far beyond what they had come to expect from the detached, conceited and unapproachable persona Nigerian politicians have cultivated over the years. This daring act by the opposition governors brought to life for many, the ongoing merger of five main opposition parties under the banner of the All Progressive Congress (APC). This merger has recently dominated the agenda of political calculations for the 2015 general elections, and is the favoured discussion point for many pundits. Importantly, many justifiably question the APC’s capability of providing a credible alternative to the norm, the ruling Peoples’ Democratic Party (PDP), focusing especially on the APC’s lack of a coherent ideology. One of the notable commentaries critiquing the proposed APC is the one by former Central Bank Governor, Professor Charles Soludo titled “Where is the Political Party for (the) Nigerian Economy?” In it, he mirrors the sincere concern of many Nigerians – that the APC is an alliance of convenience by disgruntled politicians lacking any progressive ideology save their inordinate ambition to grab power at the centre, that the “soul of the party” is not really different from the much derided PDP, and that it lacks a sophisticated manifesto. As close to the truth as this description probably is, many do not quite appreciate that the dominance of the PDP behemoth and the emergence of its soon-to-be arch nemesis, the APC, are manifestations of the continuous evolution of our democratic process. The APC cannot be that which we are not. The much cited APC’s lack of a coherent ideology is an interesting paradox. When many including Professor Soludo refer to ideology, they mean either or all of two things. One, they hark back to the left-wing right-wing parties of the 1960s to the 1980s whose class-based identities were critical elements of their mobilisation strategies. Two, they are also referring to the clear articulation of the vision, strategy and proposed programmes of such parties in an ideologically-driven manifesto. As ideal as these normative expectations of a what a party should be seem, they are neither entirely relevant to our present Nigerian reality, nor are they necessary requirements for the APC or any such movement to be agents of the much desired change in the Nigerian polity. An ideologically-driven movement is not relevant to Nigerians because globally the ideological parties that pundits long for are no longer tenable in our present unipolar (yet increasingly multipolar) world. When those class-based political parties existed decades ago, the bipolar world had two superpowers representing rival systems of political and economic organisation – the American-led capitalist West and the Soviet-led socialist East. Countries and their constituent political parties, academics and civil society organisations strongly defined themselves on the basis of either of such doctrines. In Nigeria, progressive-pro-masses politics were personified, to varying degrees, by Awolowo’s Unity Party of Nigeria (UPN), and Aminu Kano’s Peoples Redemption Party (PRP), while conservative and aristocratic politics were the forte of the Northern Peoples’ Congress (NPC) and later, the National Party of Nigeria (NPN). Consequently, such parties articulated their manifestos and strategies for policy execution loosely based on the political orientations they subscribed to. Presently, the exigencies of the global environment and Nigeria’s present realities have rendered such ideological movements – at least in the way many pundits envision – untenable. First, the global dominance of capitalism as the preferred system of economic organisation, means most of the world’s countries have adopted some variant of capitalism – whether its America’s free market capitalism, China’s state-led capitalism or Nigeria’s crony capitalism. Secondly, any movement that employs the rhetoric of a “proletariat revolution”, promising the usurpation of the “bourgeois hegemony” to appeal to the Nigerian masses – of which people under the age of 30 constitute almost 70% – will find itself left in the cold, dry winds of the Harmattan. The basic needs of ordinary Nigerians which sadly haven’t changed that much, are to be met with pragmatic promises to be achieved via strategically crafted but importantly, easily accessible methods. Nigerians still need the basics: electricity, jobs, access to quality education and efficient healthcare services; Nigerians want to feel secure in this era of kidnappings, suicide bombs and diabolical killings by “unknown gun men”; marginalised swathes of Nigerians want to feel they matter too in the scheme of things beyond being used and dumped during elections and importantly, many are just fed up with the dysfunction and culture of impunity that pervades the polity, which the PDP symbolises. Since grandiose ideologies and fancy manifestos will obviously not resonate with ordinary Nigerians, what the APC or any movement needs is the ability to tap into the collective yearnings of Nigerians from all walks of life. The enthusiasm and fervent idealism of young Nigerians from the 1960s to the 1990s fuelled by left wing political ideology has been replaced with brittle cynicism. This frustration stems mostly from our exclusionary and testosterone-driven political system especially at the core of decision-making. The archetypal decision-maker being an “Oga at the top” anywhere between 40 and 80 years, typically arrogant, accessible to cronies and colleagues, yet inaccessible to his constituency, gets away with defying many manmade, marital and divine laws with impunity, and retires to be celebrated in his local church or revered in his neighbourhood mosque rather than to the societal opprobrium he so deserves. It’s no wonder that some young Nigerians find an outlet for this frustration through Twitter and Facebook, others at markets and motor-parks perpetually feel like second-class citizens, while many in rural areas who hardly feel the impact of governance at any level just couldn’t be bothered until elections season. This cynicism pervades all segments of society. The APC or any such movement ought to become a rallying point for Nigerians to coalesce around, at the barest minimum to set the tone for a more inclusive type of governance where ordinary Nigerians will be regarded as people who matter in the scheme of things. 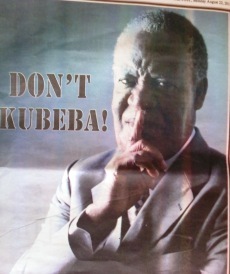 Such a movement could learn a thing or two from Zambia’s Patriotic Front (PF), the platform on which the current president, Michael Sata sailed to victory in 2011, thereby upstaging incumbent Rupiah Banda and his ruling party, the Movement for Multiparty Democracy (MMD)’s 20 year hegemony. Observers such as Cambridge academic Alastair Fraser, attribute the PF’s victory to its ability to mobilise ordinary Zambians across ethnically diverse communities, especially the critical youth demographic, through a grassroots approach to politics. The PF focused not on socialist slogans, but on the unmet needs of individual communities especially employment and infrastructure, employed a fiery anti-Chinese rhetoric and the famous “Don’t Kubeba” (accept bribes from parties but vote for your choice at the polls) slogan. Barring slight differences in context and dynamics, parallels can clearly be drawn between Zambia and Nigeria. Apparently, the key for any movement that seeks to mobilise ordinary citizens is its ability to reach out to and connect with marginalised segments of society, communicate through the language of their lived realities and basic needs, and importantly, make them feel relevant in deciding their own destinies. The brazen visit by APC governors to Maiduguri a few weeks ago, prompted President Jonathan to visit Maiduguri days later, his first visit since his election in 2011 despite the daily carnage there. This is healthy competition on both sides to score political points with the masses, and this competition is the stuff responsive democracies are made of. Ultimately, Nigerians need a credible alternative, not just to replace the PDP in power, but an alternative way of doing things, an alternative to the dysfunctional and malevolent “do-or-die” politics that has characterised our polity throughout the past 13 years of democratic rule. In this quest, it matters little whether the APC is an alliance of convenience by “desperate” power mongers, as they have been variously described, all that matters is their ability to provide an inclusive platform and a reliable alternative that Nigerians can choose to either support or ignore. The quality of our politics needs to be lifted from the grubby bottom through healthy competition engendered by a worthy rival to the PDP. Whether the APC is capable of this arduous task, only time and the strategies it adopts will determine. There is no doubt the APC could have been the real game changer to the current socioeconomic and political mess we are in today but……? so may questions to answer! The problem we have in Nigeria is that we no longer have politicians who are selfless and have the vision of our founding fathers like Sir Ahmadu Bello, Nnamdi Azikiwe, Obafemi Awolowo and others who were committed to a selfless service to their fatherland. A well thought out article, neither against nor for, its my sincere wish that the new APC is able to at least change the game, make life a bit more easier for Nigeria and take Nigeria to higher places. Nigeria in all honesty needs no assistance from any western world, we have all it takes to be a great nation and we can even help the Europeans. I increasingly lose faith in the entity called Nigeria. While we definitely need a opposition this new APC seems like an opposition just for the sake of it. And i guess we the people do not have a choice but to try a different kind of evil. The whole Name registeration brouhaha is pathetic. Yes, PDP is evil and they are trying to undermine APC but what does that say about the new ‘opposition’ if something as simple as following the proper protocol to register a political name wasn’t carried out by them?? We can shout ojoro all we want but they better go and do things by the book as far as INEC is concerned so that INEC will not have a reason to disqualify them and they now start crying foul. Also, how many ‘young’ people have flooded the new political party?? Are we really expecting much change from these old heads?? Or do we just like to talk and talk?? They only way to effect some kind of change is if there in an influx of new minds and ideas. 1/2/5/10 people won’t cut it…i mean a INFLUX of young minds willing to start from the ground up. What do i know sef. Naija matter dey taya person. If Charles Soludo is still entraped in a romantic nostalgia for the ideological politics of our bi-polar past, as Zainab would appear to be suggesting, he is not necessarily divorced from the reality of what is needed in the politics our multi-polar world of today. In my view, he was right to decry the ideological vacuum of not just the APC but the entire constellation of parties in our political firmament, made the more worrisome by pervasive absence of ethical and moral cultures that could have checkmated their pernicious tendencies once in power. The APC is a marriage of convenience by strange bed-fellows compelled by the necessity of their political dislodgement from the ruling elite and no way represents the emancipators desperately needed in Nigeria today. I don’t quite understand what you are arguing here. Are you by any chance insinuating that political parties in Nigeria cannot be ideology based at the moment? Are we to believe that a political party built without a program, but simply by convenience for the ejection of another party can somewhat miraculously effect the changes needed by the populace. Also saying that opposition governors can walk in a market in NE Nigeria can only affirm what the ruling party argues. Very convenient how they can walk around without someone blowing themselves over. Opposition or not, these same governors kidnap the resources for local governments. Fact is they are no different. As you pointed out, the basic needs of the average Nigerian has not changed. All political parties have promised to deliver on this. But since we don’t know how they plan to do this, why should I choose APGA, or APC over PDP and vice versa? In the end, it boils down to voting for personalities and not really the party. It is also sort of like rolling the dice – hoping and praying that this person we are voting for performs. I don’t think it’s enough to allow parties to just tap into our yearnings. We need to ask hard questions – how do you plan to achieve this utopian society you’re promising us? We all know resources are limited and something has to give way for another. For example, Okorocha tapped into the anger of Imo people against Ohakim to win the election. He has introduced free education from Primary to University in Imo state, promised to pay each secondary school student a monthly allowance of N100, introduced scholarship for all Imo State students studying in the State’s tertiary institutions ranging from 60K to 100K. All of these are great populist moves but the question is – how is this going to be paid for? Is this sustainable? In Dec, he gave all Imo workers a 2-week Xmas holiday. How has this affected the state finances? Nobody seems to know. People are simply hoping this is the real deal but hope is not enough. People should be asking the right questions. I totally connect with KK’s and Mohammed’s lines of thought. From all indication, APC is no game changer. They are the same old-same old crop of politicians that Nigeria has endured for a while now. The evidence to this fact lie in the points that Soludo highlighted. It is shallow to think that by ideology, he merely refers to the left-wing, centre and right-wing divide. 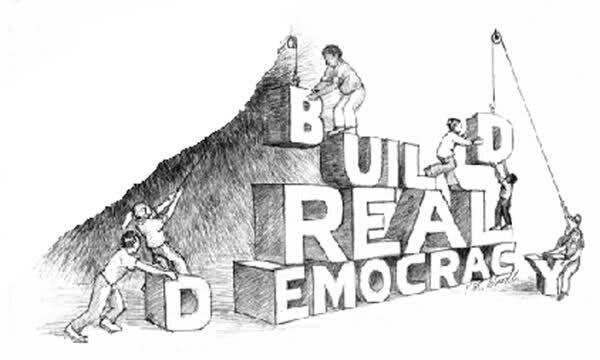 Nigerians may not want a coherent, visionary and proactive political party but they need it if this democracy thing is to be sustainable and if our needs as a people will be met in the long-term as against the short-term. As for trudging in the markets to shine teeth with the locals, I’ll rather pass- we’ve seen those moves before! They are called the “pre-election charade”. Madam Zainab, I agree that the PDP needs competition, the people need credible alternatives. However, competition for its sake can’t be the aspiration. An APC that suffers a crisis of identity will not stand up to a corruption-oiled machinery like PDP, if anything, it’s failure will result in our people being further disillusioned. The ideologies that you mention is what defines the principles by which a party will make its decisions, it defines its identity, its beacon. A man like General Buhari has a set of principles, and so regardless of his foibles, you can say where he stands on issues. An APC that merely acts as a rallying point will only make the promises that will get it in to power and then disappoint. Such a party has no direction, it reeks with a different set of corrupt individuals finally able to get their own hands on the national cake (our time to chop). Ultimately, it conspires with the PDP to deny us the one thing we yearn for, credible leadership. We reap what we sow, and until we get back to basics and get a party that truly know what it is and what it represents to the people it intends to serve, the journey to true governance will not have really started. APC is not the messiah! Nor will it evolve in to one.